pin or pinning is a feature that allows the author to choose a post to put at the top of their profile (or homepage) which is then called a pinned or sticky post. Sometimes you want to bring attention to a post that's more currently relevant than just the most recent post in your stream, e.g. By "pinning" such a post to the top of your stream, you make sure any new readers (or returning readers) who visit your homepage or profile see that post first, and consider it as recently (or still) relevant even if it is not the most recent thing you have posted. 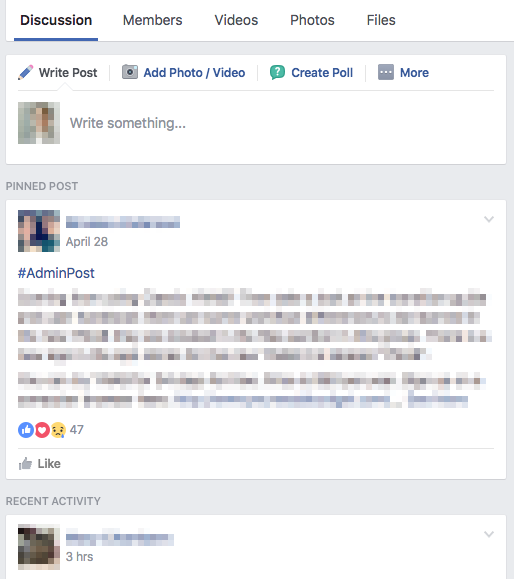 Facebook has supported pinned posts on events, pages, and groups for quite some time (the admin/creators of such posts/pages has the ability to (un)pin posts). Noticeably absent: Facebook DOES NOT have the ability for a user to pin a post on their own profile/timeline. Facebook pinned posts appear with a separate header from "recent activity" and look visually distinct from the chronological list of posts. 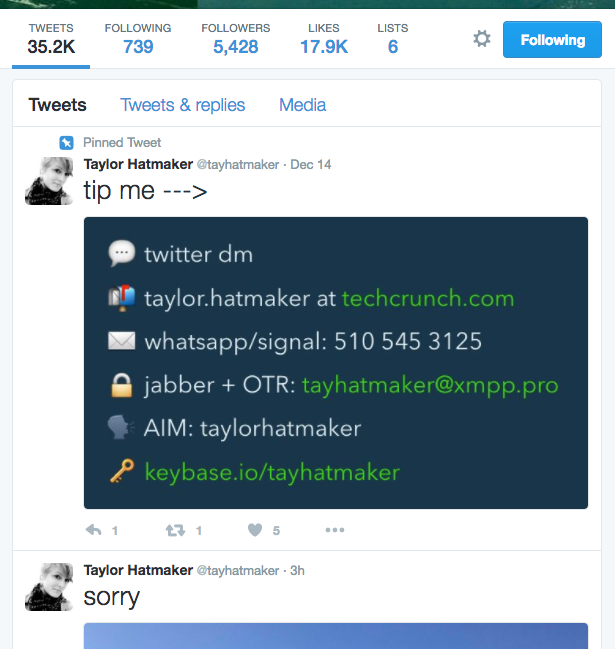 Twitter's mid-2014 UI update added support for a pinned post on a user profile. Twitter pinned tweets are marked with "pinned tweet", but otherwise are integrated into the primary list of tweets. Last.fm supports adding pinned obsessions to the top of one's user profile. These are automatically set to expire after one week. You may not want it to be the first post in your profile - because that may give the illusion that there's nothing newer. Possibly 1-2 normal in-stream posts display, then followed by the pinned post, almost like it is a promoted post for itself. Tantek Çelik: I'm pretty sure I want my pinned post to presentationally be the first post-like thing on my profile, in the stream of posts etc. Note: Aaron Parecki implements pinning as show as first post, and Twitter, Facebook both also implement pinning as first post. Any special presentational considerations for pinned posts? Besides being shown "first" (see above)? Tantek Çelik - the pinned post should have some indication that it is pinned and not just the latest post. minimum: text (and/or icon) above the post (content) like Twitter's "Pinned Tweet" or Facebook's "Pinned Post", or Aaron Parecki's little "pin" icon on a green triangle in the top right of a post block. Tantek Çelik Just an h-entry. Should a pinned post have any different markup than a regular post? Only if there is a specific use-case need, otherwise, it's just a post. Tantek Çelik Still part of explicit (or implicit) h-feed on the page. Since a pinned post should only be shown once in a stream (instead of twice, at the top and in the stream in sort order), the pinned post h-entry should be either explicitly in the same h-feed, or at least at the same level (from a microformats2 parser perspective) as the other h-entrys on the page, so that h-feed consuming code will just include it in the overall stream it presents to readers etc. The Atom feed doesn't have the pinned statuses in. Tantek Çelik I would not do anything with pinning in feed files. Readers are likely to just display in dt-published order most recent first anyway. Tantek Çelik I am considering implementing pinned posts, but having them auto-unpin (or expire) after some period of time like ~60 days. This will both make them easier to implement, and also provide an automatic way to not have to worry about unpinning something eventually. I like systems that by default clean-up after themselves. GitHub supports pinning of issues. Example as of 2018-12-28: FriendsOfPHP/PHP-CS-Fixer. This page was last edited on 22 January 2019, at 07:37.